I've been a collector of toys for a while now, and if there's one thing I've learnt, it's that the Japanese know their toys. Whether it be a big-huge robot, a monsterous demon or some half-naked schoolgirl, the Japanese toy campanies can sculpt it, detail it, articulate it and make it cool. Kaiyodo (or Xebec, according to some sources) is a company whose figures are becoming well known all around the world for their fantastic detailing, paint, articulation, poses and display/play value. As a Diamond Import, they have toys of the latest anime/manga, including Neon Genesis Evangelion, Fist of the North Star and, what we come to today, Trigun. Monev the Gale is a huge, hulking monstrosity from the Trigun anime, an anti-hero available to the side of Vash the Stampede the hero; Wolfwood, the priest adventurer; and most recently, Meryl Stryfe, the insurance lady. Since Diamond Exclusives offered him at comic and speciality stores in the US, people have raved about him, and it's not hard to see why. 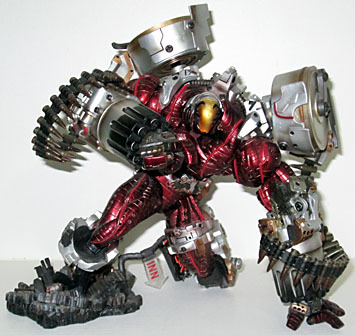 Last year, Monev was the must-have action figure of the year. When you first see this guy, you'll notice the enormous card he's on, and the huge plastic clamshell that holds him and his accessories. It's huge, and will take up a fair portion of the MOC collector's wall. The packaging is great; even as a die-hard action figure opener, I was tempted to leave him in the package and hang him on my wall. Even with the odd pose he's in, he looks great. Top points for the card, which shows off just a few of the many poses Monev can be displayed in, and has information about Trigun and the character himself. It's very nice to get info about about the figure you're buying, as McFarlane found out with the Tortured Souls novellas which sold them out. 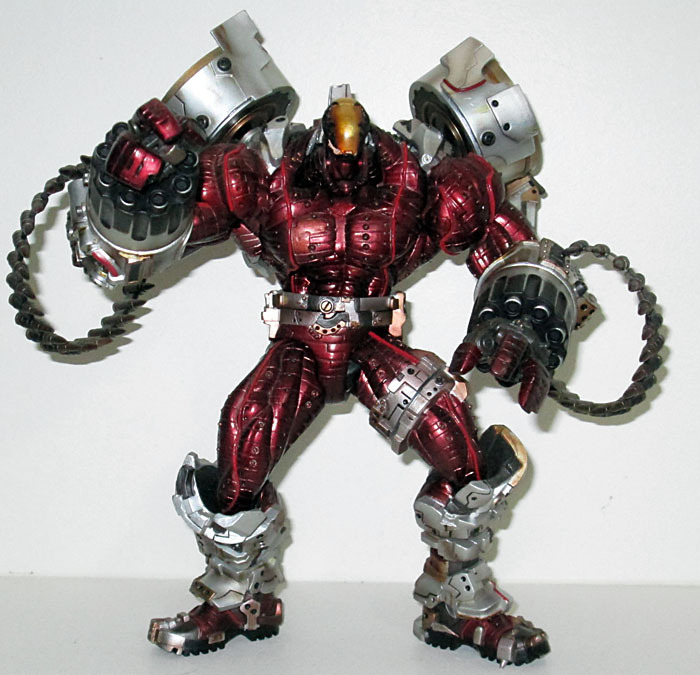 Monev himself is a huge, hulking robot-type assassin, covered from head to toe with purple-red armour plating, metallic weaponing and electronic highlights. He isn't exactly the same as his anime-inspiration, but this is not for the worst. In the anime, Monev was more bland, with metallic purple armor and little else. 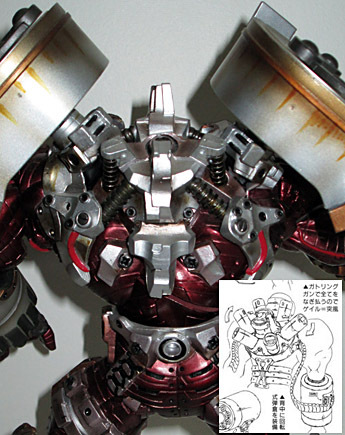 The figure version has more mechanical-technical detailing, and supports two enormous bullet-chambers which weren't in the anime (taking the place of a machine which changed the type of bullets Monev fired at Vash). 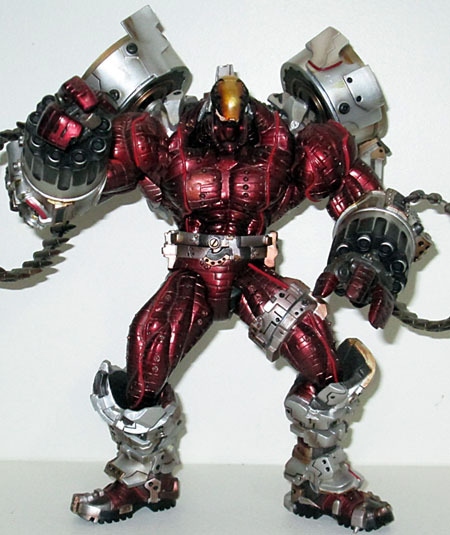 He stands almost 10" tall, with over 30 points of articulation for unlimited poses. Spider-Man Classics, eat your heart out! Almost all of the articulation is hidden, and still the poses are awesome and unlimited. The articulation, with the exception of the finger joints, is sturdy and stays in place thanks to the inner skeleton inside of Monev which makes him big and heavy. 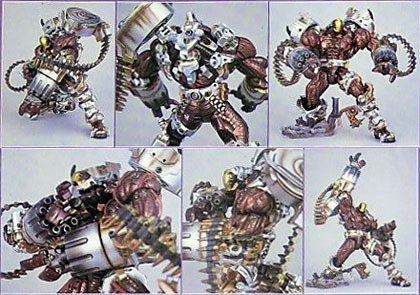 In fact, Monev the Gale is made up of over 200 individual pieces of plastic, more than any other action figure ever. 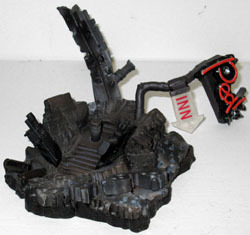 Included with him is a nifty base, which fits one of his feet, and four long springs and 64 indiviual bullet pieces. Inside the package are instructions for wiring the bullets together using the springs. Eep. For someone with big bulky fingers and not a lot of time on his hands, this is awfully tricky. But, once you get into it, wiring the bullets together is rewarding, as you slot them onto the figure and he looks brilliant. Others complained that it was a hassle, but it really wasn't that bad to make the bullet chain. 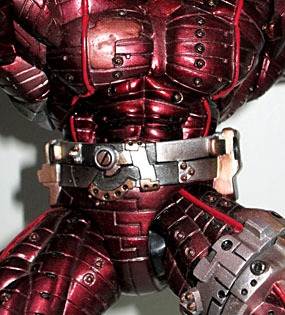 One end inserts into the huge (and removable) bullet chambers on his shoulders, the other into his huge gattling guns attached to his wrist. His gattling guns spin like he's firing at some hapless target, and he looks awesome. His visor is also articulated and can be removed, so you can see his weird face. The paint on Monev is flawless. Most of it is metallic, and looks brilliant. The rust on his bullet chamber even looks like rust. To the collectors among you who play with your toys (all four of you), there is lots of play in Monev; he can nip down to the Ninja Turtle lair, take out Malebogia and his evil accompolice Stay-Puft Marshmallow Man, then head back to the Kwik-E-Mart for a Squishee while Chief Wiggum tells him "crime doesn't pay." And I guarentee your other toys will be intimidated by him. With all this raving about how good Monev is, you have to expect some kind of drawback. 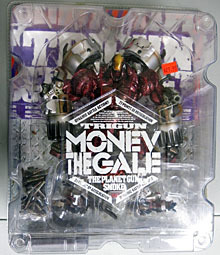 And unfortunately, there is: Monev the Gale isn't as cheap as a regular figure, and he'll probably set you back at least US$30, if you can still find one. They sold quickly, but there are still some left on eBay and some comicstores might still have them. Occasionally when Amazon.com has one of its "completely insane" sales, you can pick up a Monev at half-price, but this is an absolute rarity and is unlikely (unless your STUPID name is STUPID Jorthanulus STUPID!!) Even with the hefty price tag, Monev is still a joy to behold, and I much recommend him to the toy collector who likes quality figures - even a year after the purchase, I still admire and play with my Monev just as much as when I first bought him - he really is that damned kewl. Monev the Gale is a great action figure, for the MOC collector, the displayer, and the player. Even for the expense, he's worth it. Much recommended.